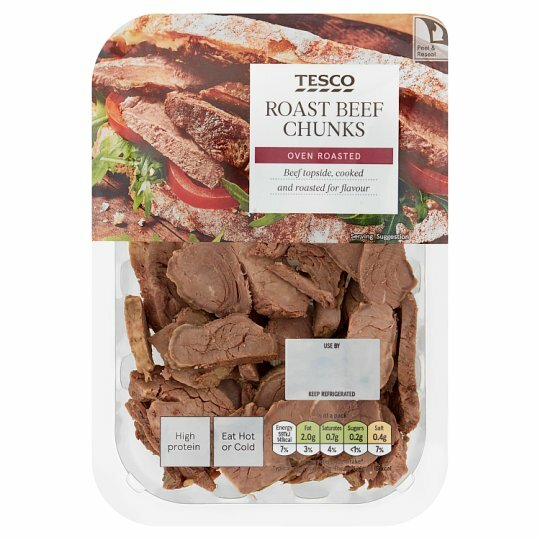 Cooked, roasted and sliced beef topside. Oven Roasted Beef topside, cooked and roasted for flavour. ​​​​​​Beef, Mineral Sea Salt, Stabiliser (Triphosphates), Salt. May be eaten hot or cold. If heating, remove film lid, empty contents onto a microwaveable plate. Cover and heat on full power. Important. Ensure food is piping hot before serving.